President Maithripala Sirisena left behind new political quagmires as he emplaned last Wednesday for the Kenyan capital of Nairobi. The visit there was for the high-level segment of the fourth assembly of the United Nations Environment Programme (UNEP) from March 11 to 15. This event is expressly for ministers or officials of the UN body which numbers 125. Sri Lanka is formally represented at the UNEP by Sunil de Silva, High Commissioner for Kenya. In fact, the UN presence in that country has been the main cause for retaining the country’s diplomatic mission there. There were moves earlier to shut it down. However, President Sirisena is the Minister of Mahaweli Development and Environment. That placed him, protocol wise, the only Asian head of state or government to attend this assembly. This is not the first time this year. In January he attended the “Third Forum of Ministers and Environment Authorities in Asia Pacific” in Singapore. Other than a handful of ministers, others taking part were officials. Of course, he seized the opportunity for a meeting with Prime Minister Lee Hsiang Loong. He sought the repatriation of Arjuna Mahendran to Sri Lanka to face charges over the Central Bank bond scandal. Interesting enough, on top of the agenda for the Nairobi event is a resolution on “marine litter and microplastics, and on single-use plastics, and the role UNEP can play.” In Sri Lanka, Sirisena has not been sucessful yet in his initiative to ban the use of polythene or plastic, from January 1, 2018. They are being used freely by shops, supermarket chains and food outlets even now. Industries are churning out more plastic bags and other products. 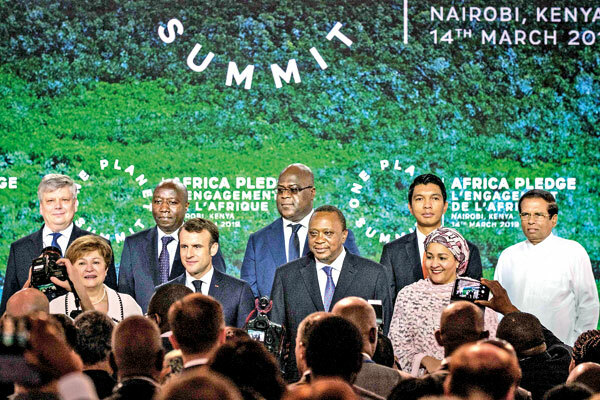 Taking time off from the stress and strain of the political turmoil here, President Sirisena last Wednesday flew to Nairobi in Kenya to attend a United Nations conference on the environment. He was the only Asian head of state to attend the session. Most other countries were represented at ministerial level. The protection of the environment has also been largely confined to statutory requirements. Approval of environmental impact assessment reports has been made compulsory by law for different projects. There are yet a number of growing environmental issues that have become a dangerous hazard to the public. One is the exacerbating sound pollution. Competing bakers have installed noisy public-address systems in three-wheelers that blare at pre-dawn in high residential areas every day. Funny enough, for some of them, the Christmas season had arrived early. The tune is Santa Clause is coming to town…. or Wish you a Merry Christmas…. playing so loud. Then follows announcers on lorries promoting vegetable plants and seeds. Hard on their heels, come the lorries asking residents to sell their old newspapers, worn out suits, used aluminum utensils and old iron. There are also the buses whose horns could, doctors warn, lead to deafness. They are so loud and reckless; drivers use them frequently to overtake on the wrong side. Only the Anuradhapura Traffic Police have taken notice of this aspect and begun checks. To say that they are on the rapid increase is an understatement but neither the Police nor those dealing with the environment have been able to do anything. It is time they go beyond the environment certificates to ensure that the people do not become victims of sound pollution. Sirisena, the President of Sri Lanka, attending a UN event meant largely for ministers and officials, no doubt, is unusual. More so when he has publicly declared on many occasions that the country is in serious political and economic turmoil. He could argue that he is the Minister of Environment. Though still arguable, it is understandable. He is the epitome of most burning political issues and the pressures arising from them are sure hurting. He took a break with his family in Thailand in December last year. He has found the opportunity for another break to get away from issues. It was last Wednesday, that Parliament was discussing the budgetary allocations for the Presidency. He was not there to defend criticism and explain achievements, he thought it would be better to fly away. This time he was accompanied by former Minister, Wijeyadasa Rajapaksha, now a legal consultant and ex minister Susil Premjayantha. In doing so, he left behind a string of political quagmires, which are bound to have serious repercussions in the political sphere. What is even more significant is the likelihood of some of them unwittingly boomeranging on President Sirisena. Perhaps neither he, nor any of his advisors (if there are), have drawn his attention to the far-reaching implications. Creditworthy enough, the political cunningness of Prime Minister Ranil Wickremesinghe, the leader of the United National Party (UNP)-led United National Front (UNF), paid heavy dividends and was cause for concern for Sirisena. President Sirisena has demonstrated signs of thawing his relations with Premier Wickremesinghe and the UNF. Has he realised that there are no prospects of his becoming the joint candidate for the SLFP and the Sri Lanka Podujana Peramuna (SLPP) at this year’s presidential election? Or is it a move to lessen tensions with the UNF ahead of a presidential poll this year? President Sirisena, the leader of the Sri Lanka Freedom Party (SLFP), has through his actions further divided his own party. Six SLFP parliamentarians rebelled against his directive and voted with the UNF on the second reading of the budget. There were others who voiced opposition to him over the directive. He has thus created a new crisis within the SLFP. How many in his own party will back him if he is their lone presidential candidate? Though talks will continue for a common alliance between the SLFP and the SLPP, President Sirisena’s actions this week have further weakened such a possibility. In the process, is he contributing to the proposed alliance not becoming a reality? President Sirisena backed out from sending his own three-member delegation to the UN Human Rights Council and agreed that Foreign Minister Tilak Marapana should lead the team. Why did he reverse his earlier hardline move, which raised eyebrows in the international community? Could he not have avoided the embarrassment with a decision earlier to have a unified approach? In the end, has he not fallen in line with the UNF approach at the Human Rights Council? That backchannel links between President Sirisena and some UNPers had remained, despite the strained relationship, is known. The over-riding factor was that it served as a sounding platform to convey each other’s thinking on different issues. That “hot line” of sorts became effective this week. It was Premier Wickremesinghe, known well for his cunning political manipulation who outdid others. He set in motion a sequence of events. Known for outsourcing his thinking on different issues to be articulated by less powerful parliamentarians, he tasked Mujibur Rahman, (UNP- Colombo Central) to make an announcement to the media. That was to say that a group of back bench MPs would not give their assent on the budgetary votes of the Presidency. This is when Parliament took up for discussion the votes during the Committee Stage of the budget debate. Non-Cabinet Minister Harsha de Silva, who was unaware of the nuances, simply denied the remarks publicly — a usual practice for him. However, the man to whom the remarks were meant – President Maithripala Sirisena – took the message very seriously. President Sirisena was in Parliament last Tuesday, just a day before he left for Nairobi. This issue was foremost in his mind. He had earlier made it known to the “Joint Opposition” leadership that the SLFP would abstain from voting on the budget. He said the MPs would keep away. The “JO” had decided it would oppose the budget. The bind now is over what would happen if the vote on the Presidency was defeated leaving him with no funds to function. There were many dissenting voices who asked Sirisena why the party is taking such a position particularly when it had earlier agreed to abstain. Duminda Dissanayake (UPFA – Anuradhapura District) was a lone voice that strongly advocated that they should back the government in the budget vote. He is known for interacting with the UNP in the past several months. After the vote in favour, a few SLFPers were now hopeful that President Sirisena would allow them to join the UNF cabinet — a move that is extremely unlikely. There was a formal explanation for Sirisena’s action. The President, who is head of government, it was argued, cannot be seen to be voting against his own administration. True. But a corollary to that argument was an important question – how then could President Sirisena join in a “common alliance” with opposition parties? The answer to this question naturally widens President Sirisena’s trust deficit with the SLPP albeit the “Joint Opposition.” This perhaps is another reason for him now trying to go soft on the UNF. He is now certain he will not be the SLFP-SLPP joint candidate at this year’s presidential election. Reports that former Defence Secretary Gotabaya Rajapaksa will be the “JO’s” choice have increased after he visited the United States Embassy in Colombo on March 6. This is to hand in papers to renounce his United States citizenship. The Embassy does not comment on such matters. Adding to that are reports that Mahinda Rajapaksa and senior members of his family at a meeting on Thursday night at his official residence in Wijerama collectively gave their blessing to his candidature. However, some senior SLFPers charged that Hirunika Premachandra was voicing her anger against President Sirisena, because, they claimed, there were moves to grant a presidential pardon to Duminda Silva, former MP, who is now serving a sentence for the alleged murder of her father Bharatha Lakshman Premachandra. He was former parliamentarian and presidential advisor. When it came to voting time, Wickremesinghe ensured there was no division. Thus, the vote on the Presidency was passed unanimously. Sirisena was airborne by that time. There was also a quid pro quo. President Sirisena concurred with the UNF on two persons to be appointed to the Court of Appeal. He wrote to the Consitutional Council recommending their appointment. Senior SLPPers alleged that Sirisena had not fulfilled his promise to appoint the senior-most person, as agreed earlier, to be President of the Court of Appeal. The two new names are now before the Constitutional Council to be members of the Court of Appeal. Moves to have them approved during a CC meeting on Sunday (today) failed. Mahinda Rajapaksa, Leader of the Opposition and a member of the CC said he would not be available on that day. Hence, the meeting has now been scheduled for Monday (tomorrow). Another was the dialogue facilitated by a former UNPer, now removed from the Working Committee by Premier Wickremesinghe, with a powerful cabinet minister. That link enabled President Sirisena, a source close to him said, to accomplish several key tasks on the economic front. The “confidence building” by this intermediary has also led to the minister receiving greater responsibility periodically. President Sirisena, much to the chagrin of UNPers, also publicly praised the initiatives of the minister concerned. The latter had been bitterly critical of Sirisena during the events in October last year. At last Tuesday’s voting for the second reading of the budget, six SLFP parliamentarians defied President Sirisena’s directive. They voted in favour of the UNF government. The SLFPers are Indika Bandaranaike (Kurunegala District), Vijith Vijithamuni de Zoysa (Moneragala District), Manusha Nanayakkara (Galle District), Lakshman Seneviratne (Badulla Distict), Piyasena Gamage (Galle District) and A.H.M. Fowzie (SLFP National List). Dilan Perera (SLFP – National List) had a meeting with President Sirisena where he questioned his decision to back the budget. Similarly, Sudarshani Fernandopulle was on her way to Parliament when she received a telephone call from President Sirisena. The latter was on his way to Negombo to attend her father-in-law’s (father of late Jeyaraj Fernandopulle) funeral. Fernandopulle had told the President that she was on her way to cast her vote at the second reading. However, the two of them did not vote. Another who was opposed to the move was Lakshman Wasantha Perera (Matale District). He was a member of President Sirisena’s team that held negotiations with President Mahinda Rajapaksa before he was named Prime Minister on October 26 last year. The Supreme Court held that it was unconstitutional. The crisis within the SLFP has been cause for disenchantment among its MPs. If it began with Sirisena’s election as President in 2015, most of the party’s old hands are not active now or backing Mahinda Rajapaksa. This has led to a few like, S.B. Dissanayake and Thilanga Sumathipala being the closest allies to President Sirisena. In the past weeks, they have been engaged in backchannel moves to persuade the SLPP to have a joint May Day rally with the SLFP. However, the initiatives did not materialise. Perhaps a test of strength will come for the SLFP when it chooses to decide whether it would hold a rally on its own and how much crowds it will be able to muster. Besides the fact that Mahinda Amaraweera did not take part in the talks on forming an alliance, another older member absent in this activity is the SLFP’s Senior Deputy Leader, Nimal Siripala de Silva. Moreover, SLFP General Secretary Dayasiri Jayasekera, who is heading his party’s delegation at the talks is also a relative new comer from the SLFP. He crossed over from the party in 2001 and later returned to the SLFP in 2013. The SLFP and the SLPP delegations met on Thursday for their first round of talks. A notable absentee was Mahinda Amaraweera, the General Secretary of the United People’s Freedom Alliance (UPFA). The SLFP team was led by SLFP General Secretary Dayasiri Jayasekera and the SLPP by its nominal leader G.L. Peiris. Both Jayasekera and Prof. Peiris, in separate statements, described the talks as “very successful” – a message which was more intended to inspire public confidence and consumption by other political parties. Nevertheless, there were heated issues. The main one which took considerable time is President Sirisena’s unexpected move to urge SLFP parliamentarians to first abstain during the vote on the second reading of the budget. Thereafter, on Tuesday he urged that they should vote in favour of the coalition government. Questions were raised about the rationale behind the issue and why he was blowing hot sometimes and cold during other times. The SLFP delegation assured that there would be a formal explanation from them when they meet next on March 21. That issue naturally raised concerns over confidence and trust they had on Sirisena. The fact that the SLFP General Secretary too had publicly criticised the SLPP de facto leader also caused concerns among SLPPers. During discussions among themselves, there were SLPP leaders who were asking whether it was wise to come to terms with the SLFP leader and his party under such circumstances. They charged that President Sirisena kept on changing his mind. However, most are in favour and argue that the precursor to the alliance is that the parties involved would pledge to adhere to the constitution and other agreed policies. The prospects of the two sides signing an agreement or a Memorandum of Understanding on the framework of their relationship was also discussed. This is besides a common constitution for all parties represented in the alliance. Another proposal discussed was for both the SLFP and the SLPP to hold a joint May Day rally. No decision was reached. 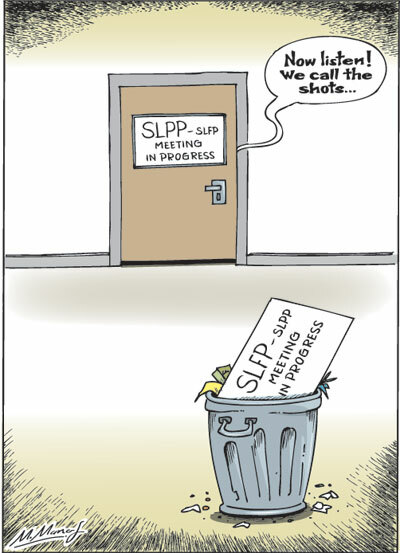 It is unlikely the SLPP will now be willing. The SLPP side is now awaiting an explanation on why the SLFP backed the government on the budget vote. If the SLPP is not happy with the answer, the process, no doubt, will be delayed. “It has little or nothing to do with President Sirisena’s candidature,” said a senior SLPP member. This raises a very serious poser. In the event Sirisena is not a joint presidential candidate and chooses to contest on his own, what would happen to the proposed alliance? Of course, that will not be known, if as Sirisena says, he would run the full term of the presidency. Obviously, he cannot have one foot in the SLFP and another in the SLPP. That is the delicate choice for President Sirisena. He would have to decide after taking into account how many SLFPers would back him and how many would leave, both to the UNF and the SLPP. A move to contest the presidency alone will see the presence of an SLPP nominee and one from the UNF — a scenario where equations could be entirely different. In such an event, the votes of the minority communities, particularly Tamils who are weighted in favour of the UNF, would become more relevant. So would the votes of the Muslim community. That also raises the spectre of a polarisation of voters on community-based lines. Sources privy to the discussion said the focus at the talks was on reviewing the past political situation and on the adoption of future policies. According to them, a draft text of the constitution of the proposed new alliance has been handed over for study by the SLFP. The matter is to be taken up for discussion on March 21 when the next meeting is held. Herein lies the crunch. Such a constitution will require all partners of the proposed new alliance to adhere to its provisions. Even if the SLFP does win concessionary terms in view of its numerical strength, there will be no new advantages to it except perhaps one. That is the fact that a common alliance would be the greatest threat to the UNF at a presidential election. It would then be a one-on-one political battle where predictions are easier than in a three-cornered one. More than anything else, the SLFP’s explanation on why Prsident Sirisena backed the budget vote, contrary to assurances given to them, will now be a key factor. As reported in these columns last week, the US-backed resolution on Sri Lanka, (No: 30/1), which was co-sponsored by Sri Lanka, is back in focus. UN Human Rights High Commissioner Michele Bachelot Jura’s report will come up for discussion on March 20. President Sirisena’s efforts to have the co-sponsorship of the resolution withdrawn did not materialise. The news release in question has been released by the “Ministry of Foreign Affairs, the Prime Minister’s Office and the Department of Information.” The shoe was on the wrong foot. The veiled, if not poisonous attack, was on President Sirisena. It was indeed an embarrassing task for Foreign Secretary Ravinath Ariyasinha, a career foreign service officer staunchly loyal to Sirisena, to issue it. The press release articulated the coalition government’s position. President Sirisena responded by picking on a three-member delegation to represent Sri Lanka – former Ministers Mahinda Samarasinghe, Sarath Amunugama and Northern Province Governor Suren Raghavan. As revealed last week, Samarasinghe was on a private visit to Switzerland. Sirisena telephoned him to ask him to stay behind and lead the Sri Lanka delegation. However, Samarasinghe returned to Sri Lanka last Tuesday and headed straight for a meeting with Sirisena. He said he would find it difficult to be in the delegation. His predicament is understandable. He had gone to the UNHRC sessions in Palais de Nations in Geneva in the past ten years and articulated one position. He said he would find it difficult to take up another position now and urged Sirisena that he be excused. Samarasinghe, who has campaigned for the continuance of the UNF government, briefed Sirisena on the different issues. He was asked thereafter to help the delegation. “Consideration of the Report of the Office of the High Commissioner for Human Rights on ‘Promoting reconciliation, accountability and human rights in Sri Lanka’ will take place at the ongoing 40th Session of the Human Rights Council (HRC) on 20 March 2019, while the draft resolution on Sri Lanka on the same theme, which Sri Lanka has signed up to co-sponsor, is scheduled to be taken up on 21 March 2019. “Following consultations held with His Excellency the President Maithripala Sirisena yesterday by the Hon. Foreign Minister Tilak Marapana among others, it was decided that the following will comprise the Sri Lanka Government Delegation from Colombo who will participate in these discussions. The fact that Sirisena invited Foreign Minister Marapana to head the delegation and make two statements – one on March 20 on the High Commissioner’s 15 page report and another on reconciliation thereafter – is again acknowledgement of the UNF’s role and position in Geneva. From a hardline stance, Sirisena has softened. Needless to say, that much embarrassment to both Sri Lanka and the people would have been saved if the conference in question was held months or weeks earlier. Requests the Office of the High Commissioner to continue to assess progress on the implementation of its recommendations and other relevant processes related to reconciliation, accountability and human rights in Sri Lanka, and to present a written update to the Human Rights Council at its forty-third session, and a comprehensive report, followed by a discussion on the implementation of Council resolution 30/1, at its forty-sixth session. The road ahead for both President Sirisena and even Prime Minister Ranil Wickremesinghe, with seven months to go for the presidential election remains a rough one. Sirisena has disqualified himself by blowing hot and cold with the SLPP and lost its backing to become the joint candidate. Now, the billion-dollar question is whether he would succeed in a joint alliance. That would only mean he will not be a candidate. Otherwise, he would have to contest from the SLFP and how much support he will receive has to be seen. Troubles for the SLPP de facto leader may not be altogether over after Gotabaya Rajapaksa is formally named the opposition’s joint candidate. He has to cope with fissures within but his enormous public relations acumen could help him overcome them. For Premier Wickremesinghe, who has stood steadfastly to his office and party leadership, the main challenge is still ahead. He would have to win the endorsement of his party to become the presidential candidate. Already posters in favour of two different UNP politicians are surfacing in different towns espousing their cases. The time frame is yet limited and a decision would have to come within weeks and not months. This week has given a pointer to how things will pan out.